We’ve been sailing Madison’s waters since 1860 and are part of what makes Madison unique. 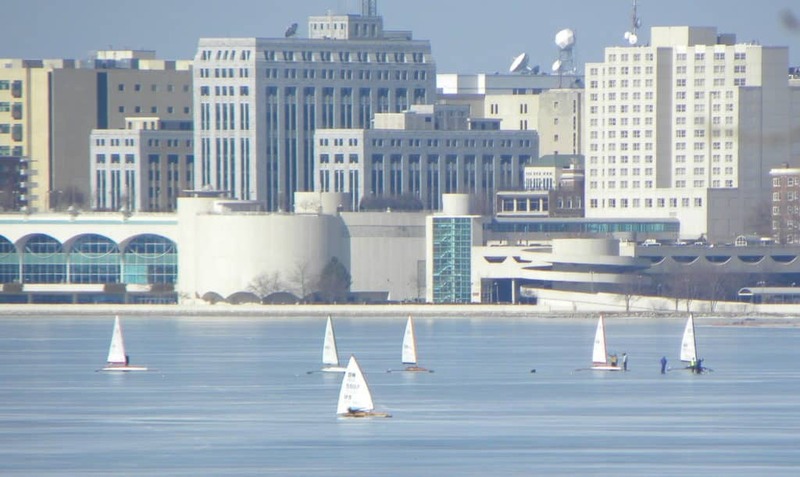 Four Lakes Ice Yacht club racing is called on for February 9-10, 2019 on Lake Monona. Use the Olin boat launch. Saturday’s races are postponed until 1 PM because of the low temperatures that are in the morning’s forecast. Ice: Tim McCormick and Don Sanford report 6″+ of ice (They couldn’t drill completely through the ice with a 6″ bit). The ice is very hard and there are some 2″ high sloped humps (no vertical faces) completely covered in ice. . Launch: The launch ramp at Olin is covered in ice. Please use extreme caution if you drive on the ice to drop your trailer. If you drive on, drop your trailer and drive off the ice IMMEDIATELY. Don’t leave your vehicle on the ice more than 5 minutes. This can’t be stressed enough! Observe all regulations at the launch including the parking lot permit.